Skate : sports equipment that is worn on the feet to enable the wearer to glide along and to be propelled by the alternate actions of the legs. It's afternoon and you're walking down a street in Salt Lake's FC Block, minding your own business. Suddenly, you see something charging at you from afar, in what seems to be break-neck speed. Is it a bike' Is it a car' No, it's a group of super kids! "In many countries around the world, it's not unusual to see people roller- skating down public roads, "says Akash Mondal, founder of the government-registered club, Fun-on-Wheels." In India, the sport is popular in places like Bangalore, Mangalore and in Maharashtra. Some cities ? Delhi and Pune, for instance ? even organise national-level competitions. But in Calcutta the sport is yet to catch on. You still have people gaping in awe when we go out for practice sessions." However, according to him, there is a definite rise in the number of people getting interested in this outdoor adventure sport, both as a hobby as well as to take part in competitions. "When I started the club three years ago, hardly two to three kids wanted to join. Now there are 250 regular students (and 60 who attend off and on). The sport is taught in the compulsory physical education classes in schools like Mahadevi Birla Girls High School, where it was first introduced in the curriculum 10 years ago. "Starting from class three, students are required to take the 40-minute course every fortnight," says principal Rashi Nirula adding, "the girls seem to enjoy the activity." And why not? 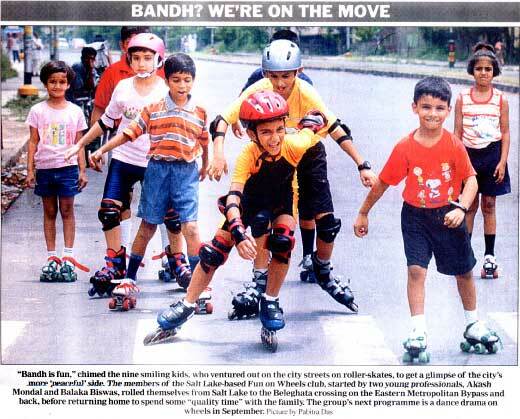 People here love adventure, says Mondal, which is why he believes that roller-skating has the potential to make it big in Calcutta. "This sport gives you speed you could never hope to achieve by running or sprinting. So what if God didn't give you wheels? That shouldn't stop you from rocking or rolling, right?" Right. So after completing a three-year professional roller-skating course in Australia, he came back home, convinced his parents to donate the spacious first floor of their huge three-storey house for a "good cause," put up a signboard and just let it roll. Initially, it was through "word of mouth" that news about the existence of the club spread. Now Mondal has started conducting training classes too. Courses are held Wednesdays through Sundays every week. Training timings are 4:30 to 6:30 on weekdays and on Saturdays and Sundays classes are held in the morning from 9 onward. Each batch, divided into three groups of basic, intermediate and advanced, consists of no more than 12 students and the classes are for one hour each. A one-time registration fee of Rs 900 is charged at the time of signing up and subsequently a monthly fee of Rs 300. Roller-skating falls into two categories. The first type is 'quads', which is on skates with four wheels placed parallel in the fronts and backs of skates. The second and more advanced group is 'inline' skating, which is done using skates with wheels that are positioned in a straight line underneath the skate. "Because the wheels run along the middle (at the bottom of the skate), balancing is more difficult. The wheels are also designed to roll faster and bounce off the ground more. Beginners should steer clear of it," emphasises Mondal. Once skaters get the balance, this can take from three days to a week, and can negotiate the hallway without toppling over or skidding, they are encouraged to venture out of doors. The first stage is to skate the asphalt roads on the block. "It's imperative that you skate on a hard surface," says Mondal. "You cannot skate on grass, mud or sand. And while it's fun to skate when it's raining, the roads get very slippery and only very advanced skaters ought to attempt this." Part of the training includes skating in Rajarhat." We need the wide, empty stretches to practice, "he says. Mondal is thankful to the Calcutta police for granting him permission to do so. 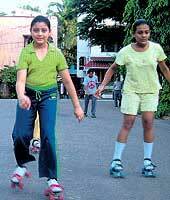 Skates can cost from anywhere between Rs 300 and Rs 3 lakh. But Mondal assures you that you need not invest any money. At the club are shoe racks lined with skates of all shapes, sizes and colours. Just take your pick. The good news is that training is not restricted to school children alone. "Age, "says Mondal," is no bar." The only thing required is balance. Anima Biswas, a college student from Bashirhat, is a regular at the club." I am taking the sport seriously and eventually intend to participate in national level competitions," she says, as she rolls off into the monsoon sunset. Mahadevi Birla Girls' H. S. School is proud of Tripti Agarwal (Class IV), who came second in All-India Speed Skating Championship 2004, Roller World Cup, Held in Karnataka. Ten states participated. She represented West Bengal and stood second. "Miss. Tripti Agarwal has been an ardent learner of roller-skating through our club Fun-on-wheels, Braindrops from October' 02. She had also participated in a Skating - Dance Show organized by us at Shabhumi and Bharatiyam where she performed on stage on roller-skates." Our sincere thanks to all media houses and personalities that have taken the initiative in bringing this sport closer to the public and generating a common interest.